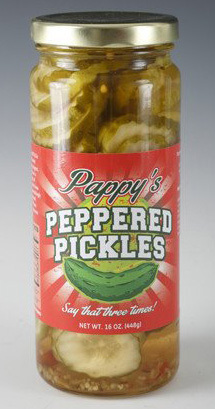 Put a Pappy's Peppered Pickle in your piehole! Perilously packed with enough pungent, peppery pizazz to placate a pachyderm, a plethora of passionate pepperheads from Paris to Pasadena painstakingly pursues Pappy's Peppered Pickles persistently. Please partake presently ... pleasure your palate pronto! 6 on a heat scale of 0 - 10. 16 oz jar.